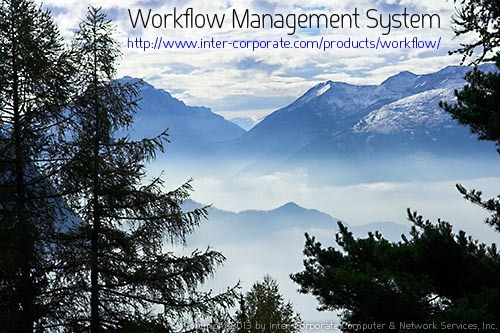 Our soon-to-be-released Workflow Management System is a custom-designed application that is implemented in a practical, modular approach to workflow management. It is suitable for small- and mid-size organizations that need to manage client information, schedule jobs, and track invoices and payments, while seamlessly automating important business functions using customized business logic that is unique to any industry. Multiple users are supported simultaneously across a diverse variety of operating environments (including Windows, Linux, Unix, and MacOS) because this cross-platform application is written in Java and relies on the fully-transactional PostgreSQL Server back-end for robust and reliable data storage, all of which support IPv4 and IPv6 network communications protocols. Please contact us for technical support or additional information. Copyright © 1992-2019 Inter-Corporate Computer & Network Services, Inc. All rights reserved. All trademarks are the property of their respective owners. The information provided on this internet site does not constitute a contract with any person or entity unless otherwise specified. Although reasonable efforts are made to present accurate information, we do not guarantee it. Information may change without prior notice.